The Jeep Cherokee then struck a cable box and a mailbox before overturning several times and colliding with a home. 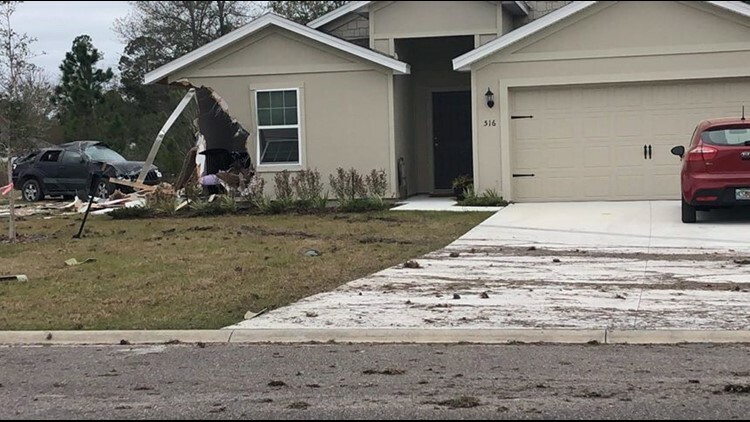 MACCLENNY, Fla. — A 15-year-old teenager was charged with reckless driving after she reportedly lost control of a Jeep and crashed the vehicle into a home in Macclenny on Saturday. Florida Highway Patrol said the teenager was traveling south on Islamorada Drive at 11:30 a.m. with two 11-year-old passengers when she lost control of the vehicle. The Jeep Cherokee then struck a cable box and a mailbox before overturning several times and crashing into the corner of a house, FHP said. A neighbor told First Coast News the driver crashed into the home's bedroom, destroying a baby's crib. The neighbor said the two-month-old baby had been removed from the crib just moments before the crash. No one inside the home was hurt, according to the neighbor. All occupants of the Jeep sustained minor injuries despite not wearing seatbelts, the FHP report said.